When locating just the right property for you to rent or buy at the best possible price, our team gets results! 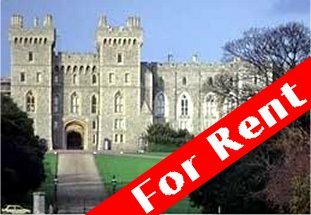 Okay...we're not really trying to rent you this castle. But, we know that your house, apartment or office is your castle and is vitally important to you. Whatever type of property, leasing arrangement and location you desire...we will help you obtain it. And, as your needs grow and change, we have the depth of experience and technology skills to meet those challenges with success. We get results! Can You Buy? - This mortgage calculator will produce and analysis report to help you determine loan amounts, affordability, mortgage qualification, or whether you should be renting or buying.. Rent vs. Buy - Use this calculator to determine whether it is a better financial decision to rent or to own a home. Ginnie Mae - Your Path to Home Ownership (including Renting vs. Buying calculator) - With the information you provide, you will receive a general estimate of how much you can afford to spend on a house; plus a calculator that gives estimates for FHA, VA and Conventional loans based on the home sale price you provide and more First Time Homebuyer tools and resources. ABA - Rent vs. Buy Calculator - If your current rent payment were going toward a house payment instead, what size mortgage would you be paying? Use this calculator to find out. Thank you for the opportunity to serve you. We look forward to supporting you in any way we can to make your buying experience as successful and as effortless as possible. Please refer to the navigation menu on the left (or the Features box above) and click on your desired option(s). If you are not able to locate what you need, please email us and we will be happy to help you. Southern New Jersey (homes) homes, Southern New Jersey (South Jersey) houses, Southern New Jersey RE/MAX (remax) Real Estate Agents, Southern New Jersey (South Jersey) Real Estate, and South Jersey properties for sale can be found here! Welcome to Southern New Jersey (South Jersey's) #1 agent Internet real estate site for buying and selling luxury homes, New Jersey (NJ) real estate and properties. Search and find over 100,000 of Southern New Jersey's (South Jersey) finest homes, houses, and properties for Sale on the Internet! Come home to New Jersey USA! Southern New Jersey's real estate site for buying or selling luxury homes or real estate in: homes, houses and properties are for sale here! Visit New Jersey Shores. Vacation property and homes! Oceanfront homes and houses and property. Waterfront homes and property. We provide moving and relocation support services. We handle real estate investment properties and 1031 property transfers. We are involved with foreclosures and bankruptcy property / properties. Find detailed information and links for New Jersey, Delaware Valley and Philadelphia area cities and suburbs: buyer agents, buyer agency, commercial property, loans, mortgages, gated country club homes, golf communities, listing agents, marketing tips, relocation, for sale by owners, real estate, homes, condos, condominiums, ranch homes, clusters, swim tennis communities, equestrian farms, horse farms, land, commercial, development, property management, equestrian centers, retirement homes, starter homes, town homes, land, investments, commercial, churches, local city government, restaurants, cafes, mortgage rates, mortgage insurance, titles, loan calculators, loan rates, mortgage calculators, refinance, title search, mortgage resources, real estate resource library, area maps, schools, colleges, education, entertainment, clubs, sports, baseball, soccer, miracle children's network, hope scholarships, sports, traffic, weather, culture, golf, homes for sale, estates, luxury homes, investment property, new homes, recreation, relocation, traffic, weather, buyer agent, listing agent, civic organizations, sports, weather, and related area links.